In order to get enrolled at a german university, you have to fulfill certain criteria. The two most important requirements are the knowledge of german language and a school certificate equal to the german high-school diploma. Applicants for an english-speaking master degree do not need to proof their knowledge in german language. 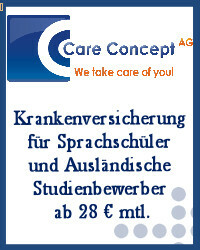 There are some requirements when proving your knowledge of German language. Whether your high-school diploma is approved in Germany, you can find on the webseite of DAAD or Anabin. May be you will need a studienkolleg course. The proof for the university entrance certificate is your high-school diploma. Your diploma has to match the assessment guidelines of the German central office for foreign education (ZAB). Admission criteria depends on the university where you apply. Furthermore, you need to get your documents of education recognised before applying at any university. This is why you have to apply at a university in the state, where you want to start your degree. Example: In order to get admission at the Bavarian Studienkolleg in München, you need to apply at first at a university in Bayern. After the successful checking of your educational certificates, they will be forwarded to Studienkolleg München. After that, you will get an admission to the entrance examination. The most public universities require a B1 certificate in German language for admission to an entrance exam. The entrance exam is mostly in the subjects „German language“ and „Maths“.